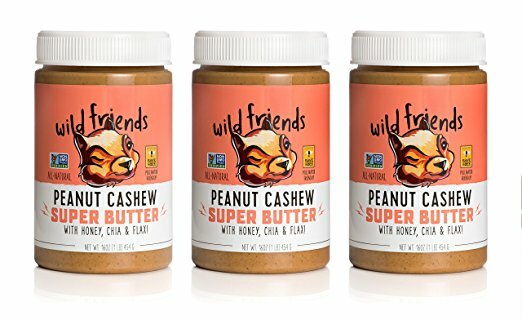 We are SUPER excited to welcome this new Peanut Cashew Super Butter to the Wild Friends family! This new super butter is a blend of peanuts and cashews with organic clover honey, chia and flax for an added boost of Omega-3s, protein and fiber! It’s delightfully creamy, and just a touch sweet and salty. It’s great on toast, or added to oatmeal bowls and smoothies! Not only is our Super Butter healthy and delicious, but each jar has a mission behind it. We’ve partnered with our friends at Glory Bee to support their Save the Bee Initiative. A portion of sales from each jar purchased, will go straight to supporting organizations dedicated to saving the honey bee. The goal of “Save The Bee” is to increase the awareness of the role and impact honey bees have on a healthy food supply. Pack of 3, 16 oz nut butter jars, Wild Friends is making food friendly! We are an all-natural nut butter company based in Portland, Oregon.